You will notice that it does call for frozen, boneless chicken breast. Yes… You did read that correctly. Frozen chicken breast will cook in your slow cooker perfectly (on low for 8 hours, on high for 4 hours)… If you decide to use boneless chicken breast that is not frozen, the cooking time would be on low for 4 hours. Empty canned diced and crushed tomatoes, olives and chickpeas into slow cooker. 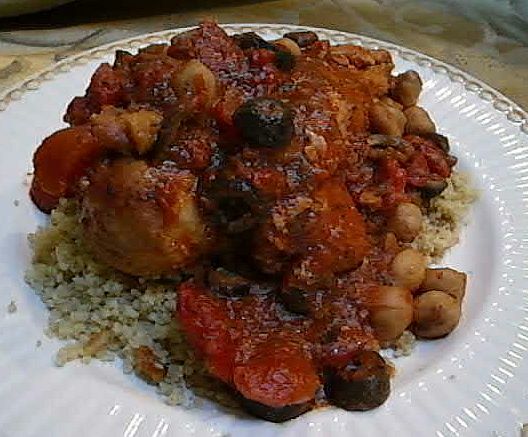 Add both Gypsy Zesty Spice Blend and Gypsy Sweet Spice Blend to the tomato/chick pea mixture. Add the frozen, boneless chicken and make sure that all sides are coated with the tomato / chick pea mixture. Add the bay leaves to the pot. Gypsy Zesty Spice Blend consists of cumin, sumac along with other select spices. You can substitute your blend of spices (or maybe even a packet of low sodium taco seasoning might be fine). This is a great technique to have in your recipe collection. You can substitute flavors out to make a creation of your own.